• The CEO says he's pleased the hospital will be able to provide obstetric services in Floyd County. "We are pleased with the state's ruling, upholding our certificate of need to add obstetric services," said Redmond CEO John Quinlivan. "We appreciate the support and approval of the Georgia Department of Community Health that enables us to expand our services and to provide families in our community a choice in obstetrical care." As a condition of approval of the project, Redmond re-committed to providing charity and indigent care at the hospital at or in excess of three percent of adjusted gross revenue at the hospital. Floyd Medical Center appealed the initial certificate of need authorized for the project March 26, 2018. In 2008, the General Assembly passed Senate Bill 433, certificate of need reform legislation which included the perinatal choice exception. This provides that applicants for basic perinatal services are not required to show need in circumstances where only one other hospital in the applicant's county provides the service as well as there are not "at least three different health care facilities in a contiguous county providing" the same service. At first, that exception applied only to Floyd, Dougherty and Muscogee counties. Now, Floyd County is the only county where that exception could be applicable. Floyd Medical Center has been responsible for 95.6 of the births to Floyd County mothers. In the immediate area, 96 percent of babies born to Chattooga County residents are delivered at FMC and 80.1 percent of Polk County residents have their babies delivered at FMC. Evidence presented during five days of hearings in December revealed that FMC ranks as the ninth busiest hospital in the state for obstetrical services. The hearing officer concluded, "there is neither significant under-utilization in Floyd County, nor in the proposed service area generally, nor is there an existing alternative to the project" and affirmed the certificate of need for Redmond. Redmond's plan has a total budget of $21.8 million, with the bulk of that, $18.2 million coming in construction costs. The perinatal area would encompass almost 28,000 square feet of space, the bulk of that representing new construction. Redmond's plan includes nine labor-delivery-recovery-postpartum rooms and one cesarean-section room. A seven-bassinet nursery is also included in the construction plan. Redmond projects that, during the first year of its obstetrical service, it will have between 700 and 731 obstetric-patient admissions and projects 770 obstetric admissions by the second year. • Legislation limiting local control over building design standards appears stalled. Rome City Commissioner Evie McNiece proclaimed a victory for home rule and local activism when a bill that would have limited the board's zoning authority stalled in the Georgia General Assembly. "Sometimes you think you can't make a difference, but you can, " she told the board. House Bill 302 failed to make it to the floor for a full chamber vote before the Crossover Day deadline. The measure would have prohibited the enforcement of local design standards for any single-family home or duplex outside an historic district. 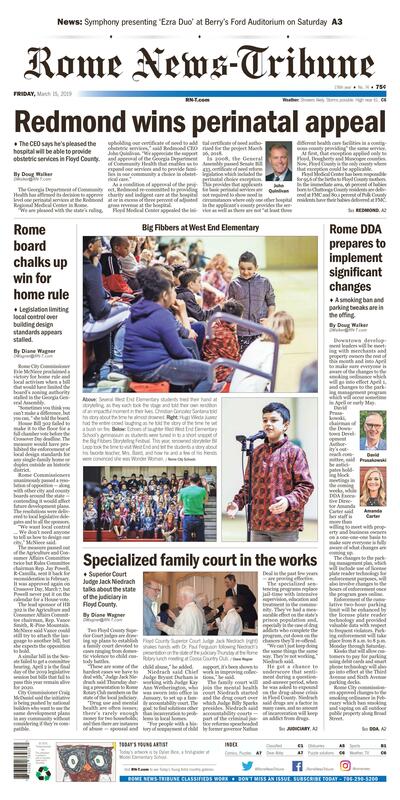 Rome Commissioners unanimously passed a resolution of opposition — along with other city and county boards around the state — contending it would affect future development plans. The resolutions were delivered to local legislative delegates and to all the sponsors. "We want local control ... We don't need anyone to tell us how to design our city," McNiece said. The measure passed out of the Agriculture and Consumer Affairs Committee twice but Rules Committee chairman Rep. Jay Powell, R-Camilla, sent it back for reconsideration in February. It was approved again on Crossover Day, March 7, but Powell never put it on the calendar for a House vote. The lead sponsor of HB 302 is the Agriculture and Consumer Affairs Committee chairman, Rep. Vance Smith, R-Pine Mountain. McNiece said Vance could still try to attach the language to another bill, but she expects the opposition to hold. A similar bill in the Senate failed to get a committee hearing. April 2 is the final day of the 2019 legislative session but bills that fail to pass this year remain alive for 2020. City Commissioner Craig McDaniel said the initiative is being pushed by national builders who want to use the same development plans in any community without considering if they're compatible. Several West End Elementary students tried their hand at storytelling, as they each took the stage and told their own rendition of an impactful moment in their lives. Christian Gonzalez Santana told his story about the time he almost drowned. Hugo Villeda Juarez had the entire crowd laughing as he told the story of the time he set a bush on fire. Echoes of laughter filled West End Elementary School's gymnasium as students were tuned in to a short snippet of the Big Fibbers Storytelling Festival. This year, renowned storyteller Bil Lepp took the time to visit West End and tell the students a story about his favorite teacher, Mrs. Baird, and how he and a few of his friends were convinced she was Wonder Woman. • Superior Court Judge Jack Niedrach talks about the state of the judiciary in Floyd County. Floyd County Superior Court Judge Jack Niedrach (right) shakes hands with Dr. Paul Ferguson following Niedrach's presentation on the state of the judiciary Thursday at the Rome Rotary lunch meeting at Coosa Country Club. Jack Summerbell (from left) laughs at a comment from across the table as Martha Summerbell talks with returning Rome Rotary member Harold Newman, retired president of Shorter University, during the organization's lunch and meeting Thursday. Rome City Commissioner Jamie Doss (center) listens to a tablemate speak Thursday during the Rome Rotary lunch. Two Floyd County Superior Court judges are drawing up plans to establish a family court devoted to cases ranging from domestic violence to child custody battles. "These are some of the hardest cases we have to deal with," Judge Jack Niedrach said Thursday during a presentation to Rome Rotary Club members on the state of the local judiciary. "Drug use and mental health are often issues; there's rarely enough money for two households; and then there are instances of abuse — spousal and child abuse," he added. Niedrach said Chief Judge Bryant Durham is working with Judge Kay Ann Wetherington, who was sworn into office in January, to set up a family accountability court. The goal: to find solutions other than incarceration to problems in local homes. "For people with a history of nonpayment of child support, it's been shown to work in improving collections," he said. The family court will join the mental health court Niedrach started and the drug court over which Judge Billy Sparks presides. Niedrach said accountability courts — part of the criminal justice reforms spearheaded by former governor Nathan Deal in the past few years — are proving effective. The specialized sentencing programs replace jail-time with intensive supervision, education and treatment in the community. They've had a measurable effect on the state's prison population and, especially in the case of drug addicts who complete the program, cut down on the chances they'll re-offend. "We can't just keep doing the same things the same way. They're not working," Niedrach said. He got a chance to underscore that sentiment during a question-and-answer period, when he was asked to expound on the drug-abuse crisis in Floyd County. Niedrach said drugs are a factor in many cases, and no amount of incarceration will keep an addict from drugs. "The effect on their family doesn't matter to an addict, the possibility of death doesn't matter ... You've got to have education, treatment and prevention. If you don't have that, you're wasting your time," he said. Methamphetamine, crack cocaine and illegal use of prescription drugs are the most common cases that come before him. But Niedrach said the opioid crisis is escalating, with people addicted to prescription painkillers turning to street drugs when their prescriptions run out. "We are seeing a lot of cases involving heroin," he said. "And even fentanyl, which can be 100 times the strength of morphine." Niedrach touched on a number of other issues during his talk, including the growing need for more space in the Judicial Building to recent changes to state DUI laws. He closed out with the observation that social media such as Facebook posts, Instagrams and text messages is being used more often as evidence in court. "My advice is simple: Don't put anything on social media that you don't want your mom to see," he said. Floyd County Superior Court has four judges, who each average about 1,100 criminal and 600 civil cases a year, and three senior judges who can fill in at need. • A smoking ban and parking tweaks are in the offing. Rome Building Inspection Chief Howard Gibson told DDA members Thursday that the permit for this project in the 400 block of Broad Street has expired. David Prusakowski (from left), Connie Sams and City Manager Sammy Rich listen to DDA Executive Director Amanda Carter explain how her staff will help inform merchants and property owners better relative to changes in parking management and a new smoking ordinance. Downtown development leaders will be meeting with merchants and property owners the rest of this month and into April to make sure everyone is aware of the changes to the smoking ordinance which will go into effect April 1, and changes to the parking management program which will occur sometime in April or early May. David Prusakowski, chairman of the Downtown Development Authority's outreach committee, said he anticipates holding block meetings in the coming weeks, while DDA Executive Director Amanda Carter said her staff is more than willing to meet with property and business owners on a one-one-one basis to make sure everyone is fully aware of what changes are coming up. The changes to the parking management plan, which will include use of license plate reader technology for enforcement purposes, will also involve changes to the hours of enforcement once the program goes online. Enforcement of the cumulative two-hour parking limit will be enhanced by the license plate reader technology and provided valuable data with respect to frequent violators. Parking enforcement will take place from 8 a.m. to 8 p.m. Monday through Saturday. Kiosks that will allow customers to pay for parking using debit cards and smart phone technology will also go into effect at the Third Avenue and Sixth Avenue parking decks. Rome City commissioners approved changes to the smoking ordinance in February which ban smoking and vaping on all outdoor public property along Broad Street. The ban extends along side streets for a distance of one block and includes the parking decks, Town Green in front of the Forum River Center and Bridgepoint Plaza. Carter also said her staff is working on a new flyer that will be distributed downtown related to changes in the smoking ordinance which will include information about smoking cessation classes that will be offered through the Northwest Georgia Cancer Coalition in Rome. The Cancer Coalition was one of the leading proponents of the changes to the smoking ordinance, in large part, to protect non-smokers from the impact of secondhand smoke. The DDA approved facade grants for Brian Lieberman at his Lieberman Family Chiropractic offices at 421 Broad St. and Amanda Farrell at Farrell's Frame and Design shop at 1166 Broad St.
Carter said both of the facade projects involve some paint work on the buildings. Lieberman is also replacing windows on his building while Farrell is getting a new awning at her shop in the Cotton Block. DDA members also spent some time with Building Inspection Chief Howard Gibson, talking about code enforcement issues such as broken windows and work at 409 Broad St., a building owned by Nathan Roberts which has been under construction for close to 20 months. Gibson said his staff has followed up on, and is addressing, concerns brought to his attention. Today's artwork is by Dylan Bice, a first-grader at Model Elementary School.